This is the best compact compact crossover for you if you want a brilliantly packaged backpack of a car. Spend extra for the turbocharged engine, and you’ll add a dose of performance at odds with this five-seater’s conservative looks. Styling updates, improved driver-assist features, and added refinement upgrade this surprisingly spacious wagon for model-year 2017. They strengthen the appeal of a crossover that’s overtaken the midsize Outback crossover as America’s top-selling Subaru. And they further distance Forester from the automaker’s similarly sized, but younger-trending Crosstrek. Should you buy a 2017 model or wait for the ‘18? Buy the 2017 to get the styling and technology that’ll see Forester through to its next full redesign, likely for model-year 2019. The ’18 model won’t change in any way worth waiting for, but it’ll cost more than the ’17. Plus, you’d be purchasing a crossover in the final year of its design generation, which means good inventory clearance prices but does little for resale value. The 2017 lineup continues along a pair of branches defined by the two available engines, both four-cylinders that use Subaru’s traditional “boxer” design. The 2.5i limb supports four trim levels: base, Premium, Limited, and Touring models. The more powerful and more expensive turbocharged 2.0XT branch returns with Premium and Touring grades; it accounts for about 10 percent of Forester sales. In a class where rivals come standard with front-wheel drive and charge extra for all-wheel drive (AWD), every Forester again is AWD. A subtle facelift gives the ’17 Forester a more substantial look. The grille and front bumper are reshaped and the headlights are sleeker. XT versions are again distinguished by a larger lower air intake and vertical front fascia vents. Taillights are revised LED designs. New wheels with trendy black accents further freshen the 2.0XT models and the 2.5i Premium and Limited trims. Touring versions are newly available in exclusive Sepia Bronze Metallic paint, and their standard leather upholstery is now available in upscale perforated saddle brown with contrast stitching. All models get a new steering wheel with easier to use audio, Bluetooth, and cruise controls. And every Forester is quieter inside thanks to added soundproofing, an acoustic windshield, and thicker door glass. The boxy profile is unchanged. It still suggests an inflated compact station wagon, versus the junior-SUV look of most competitors. Don’t be fooled. The tall roofline and no-nonsense cabin design make this one of the roomiest — and airiest — crossovers in the class. Forester in fact has more passenger and cargo space than the Honda CR-V, Toyota RAV4, Ford Escape, Mazda CX-5, and Nissan Rogue. No changes, as Subaru sticks to an engine design that arranges cylinders not in a V or inline vertically, but opposed horizontally, like two boxers counterpunching. This compact layout contributes to a lower center of gravity and benefits handling. The 2.5i models have a naturally aspirated 2.5-liter making 170 horsepower and 174 pound-feet of torque. That’s on par with the base engine in most rivals, although to the delight of the relative few stick-shift fans, Base- and Premium-trim 2.5i Foresters come with a six-speed manual transmission. In this competitive set, only the Jeep Compass offers manual transmission in combination with AWD. Optional on the Base and Premium 2.5i and included with every other Forester is a continuously variable transmission (CVT). A CVT does the job of an automatic transmission but without stepped gear ratios. On all CVT-equipped Foresters except the Base model, the AWD system is made more off-road-capable by Subaru’s X-Mode traction system. XTs employ a 2.0-liter turbocharged to 250 horsepower and 258 pound-feet of torque, making them among the most powerful crossovers in the class. For ’17, their AWD system is augmented by torque vectoring. This can direct power laterally, rather than primarily fore and aft, for better handling and stability on any surface. Acceleration with the 2.5i models is perfectly adequate to the task, although around-town throttle response can suffer from the CVT’s delay tapping engine power. Specific CVT programming, steering-wheel “shift” paddles, and much more torque, renders any delay far less pronounced in the XT models. They’re genuinely quick. Equipped with a handling-tuned suspension and 18-inch wheels versus 17s on the 2.5i line, XTs drive with rewarding poise, as well. They feel sportier than the 2.5i versions, which have less lateral grip and more — though not excessive — body lean and in fast turns. All models absorb bumps well and benefit from a quicker steering ratio for ’17. Off-road and in the snow, these are remarkably adept crossovers, a virtue only the Jeep Cherokee even attempts in this class. In fact, Forester and Cherokee top the segment with 8.7 inches of ground clearance. The main change beefs up the capabilities of Subaru’s EyeSight driver-assist technology, adding lane-wander-correcting automatic steering and over-the-shoulder blind-spot detection with rear cross-traffic alert. 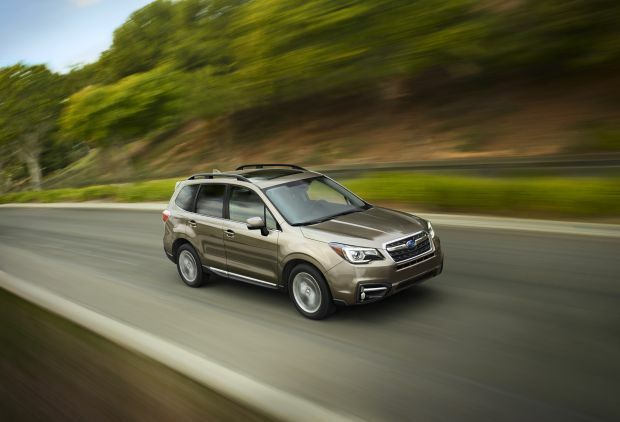 They augment the system’s ability to automatically stop the Forester to prevent a frontal collision, an asset that earns an EyeSight-equipped model coveted status as an Insurance Institute for Highway Safety (IIHS) Top Safety Pick+. 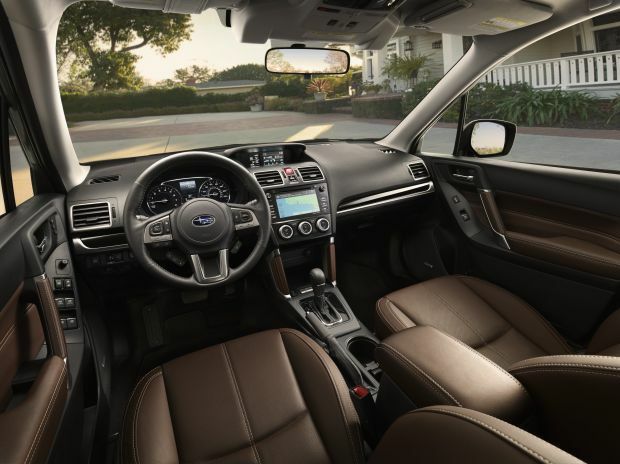 EyeSight is optional, but to Subaru’s credit, it’s available on all but the 2.5i Base model. Most competitors limit such safety systems to top-trim levels. Creature comforts expand for ’17 with two Forester firsts, an available heated rear seat and a heated steering wheel. Premium models are now available with the power liftgate previously exclusive to Limited and Touring versions. All ’17 Foresters come with a rearview camera and the automaker’s Starlink infotainment interface for hands-free smartphone linking and streaming, integration of apps such as Pandora, and USB iPod control. Premium versions build on Base models by supplanting a 6.2-inch Starlink dashboard screen with a 7-inch display and text-messaging capability. They also replace 17-inch steel wheels with 17-inch alloys and add such standard features as automatic climate control, a power driver’s seat, and panoramic moonroof. On Premium models, the All-Weather Package (heated mirrors and front seats and a windshield-wiper de-icer) is standard with manual transmission and optional with the CVT. Limiteds include all that, plus leather upholstery, silver-and-black interior accents, and body-colored mirrors with integrated turn signals. Touring models include all that, plus a high-watt Harman/Kardon-brand audio upgrade, pushbutton ignition, and more. EyeSight-equipped Premiums and Touring have automatic braking while reversing, plus steering-linked LED headlamps with automatic high beams. Prices increase modestly for ’17, and continue to track slightly higher than front-drive versions of comparable rivals while drawing even with those of AWD versions. 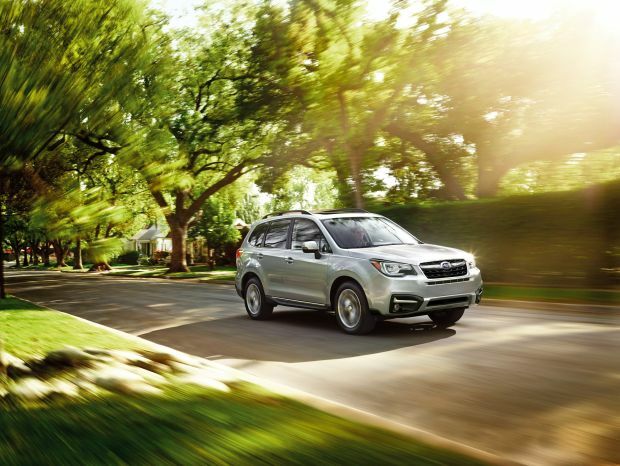 Adding to Forester’s value proposition are resale values among the highest in the segment. (Base prices here include Subaru’s $875 destination fee.) In the 2.5i line, Base versions start at $23,470 with manual transmission and at $24,470 with CVT. Premiums begin at $26,370 and $26,870, respectively. Limiteds are priced from $30,070, the Touring from $32,170. In the 2.0XT line, the Premium starts at $30,170 and the Touring at $35,170. Among key options, EyeSight combined with the All-Weather Package is a $1,695 option on the Premium model; adding the power liftgate makes it $2,145. EyeSight will connect with smartphone navigation apps, but an imbedded nav system is optional on Limited and Touring. Its graphics, controls, and refresh rate feel a generation behind most rival systems, but it will continue to provide GPS mapping when you’re out of cell range. On the Limited, it’s $1,300 in combination with the Harman/Kardon audio upgrade and $2,945 with EyeSight. Because the audio upgrade is already included in Touring models, adding nav costs $1,595. Until a few years ago, fuel-economy ratings trailed those of key rivals – an uncomfortable situation for a brand so identified with environmental consciousness. But Subaru has brought its powertrain technology up to date and Forester’s mileage now is competitive with even front-drive versions of crossovers in its set. In the 2.5i line, ratings are 22/29/25 mpg city/highway/combined with manual transmission and 26/32/28 with CVT. The 2.0XT models rate 23/27/25 mpg. Subaru recommends premium-octane gas for this turbo engine. What’s next for the Forester? The model-year 2019 redesign will move Forester to Subaru’s new global vehicle architecture, a lighter, stiffer platform debuting in late 2016 on the automaker’s all-new 2017 Impreza compact car. Subaru says the structure will afford European-grade handling and be compatible with gas, pure-electric, hybrid, and plug-in hybrid powertrains. It’ll also underpin the brand’s more aggressive new styling themes. The next-gen Forester will indeed look more muscular, but will retain its efficient packaging without adding much size or weight.